Barcelona will soon become the home of innovation and next-generation technology and the impressive Fira Gran Via venue will be THE place to discover what's in store for the future of mobile. From VR, AI and IoT to Drones and Robotics, The Mobile World Congress will showcase how mobile is creating a better future today. If you live and breathe #mobile and bright ideas just like us, you will want to be part of this massive event. And we can make that happen! 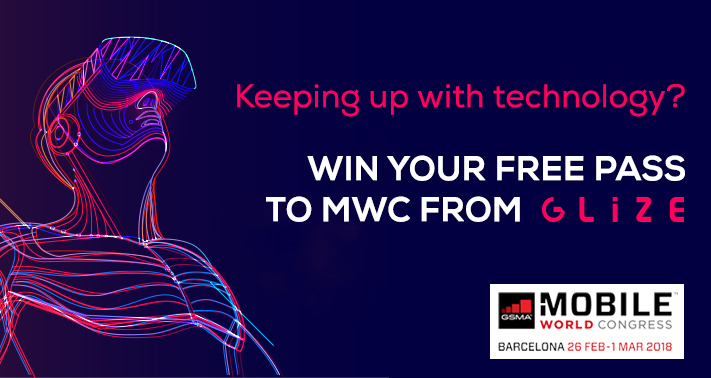 Glize is giving away three Mobile World Congress Visitor Passes worth €2400! Simply comment on our Facebook video and let us know what you would like to discuss with #TheGlizers while at the event. We will announce the three lucky winners during a draw on February 9th, so stay tuned for updates. Experience hands-on demonstrations and an exhibition featuring the technology of tomorrow. We will be waiting for our industry friends and partners at Booth G31 in the App Planet Hall 8.1. The coffee is also on us.